Virtual reality educator Jane Wilde (right), talks to Julie LeMoine about her work and vision around education and virtual reality. We are delighted to start the Spotlight Interview series with a virtual reality learning designer extraordinaire Jane Wilde. Jane has worked for many years to help others learn how to harness technology for great impact in education. Jane has worked for more than 30-plus years in the area of learning in the digital age. She is the founder of Absolute Computing Solutions, and until recently, was a professor at Marlboro College’s Center for Graduate and Professional Studies where she taught classes on the use of technology and gaming in teaching. Jane has been teaching these classes and more within virtual worlds, such as Second Life, OpenSim and gaming environments including World of Warcraft and Minecraft. Jane’s background in the hands-on use of technology for teaching through many advances and into virtual worlds is what make her so extraordinary at helping other teachers and learners discover the impacts these support tools can bring to the teaching table. Paramount to Jane’s passion is how these amazing spaces can bring out diversity in ideas. Jane has just opened a new chapter of her career, becoming the instructional designer at Linfield College in McMinnville, Oregon. It is clear that college has a new kind of course designer! Julie: So Jane, having taught in Second Life and OpenSim for so many years, tell us a little bit about how it felt at first. Jane: We start out thinking about virtual worlds as a place to meet, but there are four main tools really, first the visual environment; second, the ability to project yourself into an avatar, third the construction tools if there are any and fourth all the communication tools. In virtual worlds all of these are so important for learning. 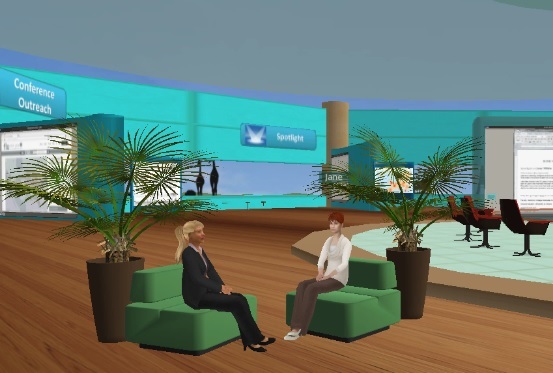 Julie: So, let’s talk about the virtual world avatars for a moment. This topic is hotly debated. Some feel avatars are critical to the experience, while others say just put them into first person and even get rid of them all together. They are on your 1-4 list so what makes them so important in your work? Jane: What I’ve found, from a learning perspective, is that by the time a student is in college, probably sooner, they have an idea of themselves as a learner. This [idea] may be an obstacle for them. And, projecting themselves as an avatar may give them a new opportunity to try to be and learn in different ways than ever before. Also, class discussions tend to be dominated by the quick thinkers, the assertive, confident, and very articulate, where language is their mode. But in an online virtual environment, the shy student, those that can’t break into a conversation, the second language learner, and those that might need extra time to process what is going on, can participate via text. Julie: But you can do that text technique today with previous generation tools such as Adobe Connect, or Skype, so why is it a big deal in virtual worlds? Jane: Ah, you can do any one or two of my top four things in many tools, but not all of them together as you can in a virtual world. In a virtual world, you can create an authentic learning situation that cannot be created in even a real [physical] classroom. You can situate the learner in a science lab or in a historical setting. We find this can be very powerful to help the learner make sense of the meaning of the material and also, to retain it better. Talking heads with a screen-share tool is nothing compared to being there, situated in a learning environment! Julie: Feels like we have been here before, in the 2007-2009 timeframe for education and educators? Jane: We have seen the hype cycle happen; back then, we early adopters could not bring everyone along. The technology was not there yet for everyone. Now we are seeing we are able to use it more commonly. Eventually it will not be talked about as virtual reality or virtual worlds — it will be as ubiquitous as email or the telephone. It will be the classroom. Education tends to be slow in adopting new technology. What is an exciting thing about my work is that I teach those who then become my collaborators. I get to work with teachers who are then my partners in this work all over the world. One of my proudest accomplishments is that my course is now a required course in programs at two universities. Julie: Talk about the future for Education, anything you want to address in this area? Jane: I’d like to discuss two things. The first is that I do see the need for a physical classroom greatly reducing and going away over time. We will still need a time to meet live but will not need a physical place. The other thing is that is happening in education is we are beginning to recognize that the cross-pollination of ideas is so, so important as we become more of a global society. Teachers need to get out of their comfort zones. They tend to be locked in their classrooms or departments. Virtual reality and in particular virtual worlds give us the opportunity to get beyond just our department, our discipline, our perspective. Julie: Ah, the broader world? Jane: Yes, bringing the local and the global together. We need to teach students this. And we educators also can and should demonstrate global participation ourselves. Julie: Any thoughts on Heads Up Displays and the classroom? Jane: I think wearable technology will be so important in the future, but HUDs, as they are today, are still a little clunky. I’d like to talk about high fidelity and where it is critical. For some training scenarios such as flying an airplane or intricate surgery, we need absolute high quality high fidelity; it is critical. But, as an educator, I also feel that high fidelity is not as important in many, perhaps most, aspects of learning. The human mind can fill in the gaps and use of imagination is critical in so many areas in learning. Julie: With mixed results coming out of MOOCs – lots of interest but grades are not great so far – what is your take? Jane: I think MOOCs [Massive Online Open Courses] are only useful if the learners are highly motivated, have enough background knowledge to cope with the material, and can find intrinsic personal rewards from doing this. It is not for all students. We have books; this is what books have done. Julie: Fascinating. So they are like this century’s books, you’re saying, self study? Jane: Yes, you have to be motivated to benefit. To be clear there are two camps in MOOCs right now. My comments are about xMOOCs, where you put out a class to thousands, very one way. There is another camp that focuses more on self-organizing groups of interest. The cMOOC is a different use case. But even there, it is still for the very motivated learner. Julie: Interesting. We wanted to start with someone as accomplished as you as our first spotlight, someone who educates our educators using virtual reality and virtual worlds. So, thank you for these insights. Jane: My pleasure. The work of WiVR is important to me. There are so many women doing stunning things in virtual reality. I cannot wait to read future interviews with some of these impressive women who push the boundaries.